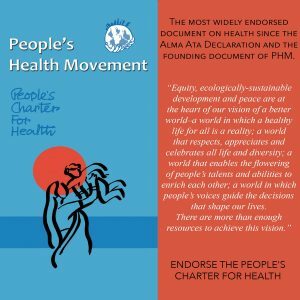 The People’s Health Movement (PHM) is a broad network of health and human rights activists across the world guided by the principles of the People’s Charter for Health. With presence in over 70 countries, PHM friends are involved in issues as wide-ranging as accessible primary care, the corporatization of global health governance, and the impact of trade and extractive industries on community health. We advocate for the right to health locally in our communities, regionally with neighboring countries, and globally. PHM-Canada and PHM-USA form PHM’s North America Region (PHM-NA). We are a network of individual volunteers and organizations, with no central office or staffing. Our work is coordinated at the country level, and we often work together on issues that impact across both countries. Visit www.phmovement.org to learn more about PHM’s global structure, programs and work in other countries. On November 16-19, 2018 health activists from across the globe gathered in Savar, Bangladesh for the 4th People’s Health Assembly (PHA4). Click here to read reports and reflections from PHM-NA attendees to the Assembly! 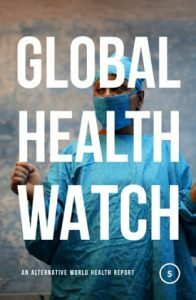 In an ongoing project, PHM-North America is collecting inspiring stories from around the world of movements that have successfully protested privatization of health services. From these movements and their campaigns we can learn lessons to reinforce and inspire our own work to achieve public, accessible, affordable health care. Read more. Global Health Watch provides information and analysis embedded in a vision of the world and of human society that is more just, more equal and more humane.The latest edition, Global Health Watch 5 (GHW5), combines rigorous analysis with practical policy suggestions and offers an accessible and compelling case for a radical new approach to healthcare across the world. It addresses the key challenges facing governments and health practitioners today within the context of rapid shifts in global governance mechanisms and the UN’s Sustainable Development Goals. Like its predecessors, GHW5 challenges conventional wisdom while pioneering innovative new approaches to the field. Read more. 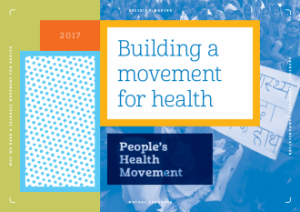 Building A Movement for Health, is a collection of inspiring stories, experiences, and “best practices” activists around the world have used to build a people’s movement for health. The book focuses on people’s engagement, how they became and stayed active, and people in the movement having control over the actions. Read more.